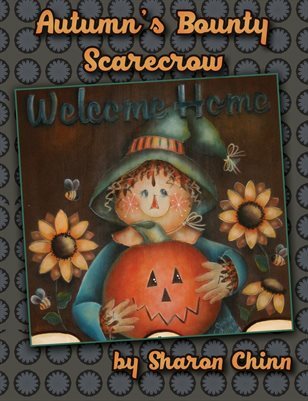 Scarecrow and Jack-o-Lantern on 8"x10" banner or surface of your choice. Painted with DecoArt Traditions Acrylics with conversion to DecoArt Americana. 8 pages with photos, instructions, supply list, line drawing in 2 sizes to trace and transfer.